The title of the infographic is "Growth rate in median total income of households by province and metropolitan area, 2005 to 2015"
This chart shows the real growth in median household total income for provinces, territories and metropolitan areas in Canada between 2005 and 2015. The horizontal axis measures the growth rate from -30% to +50%. There is a vertical red line at 10.8% on the horizontal axis, representing the Canadian median household income growth rate. The vertical axis consists of 13 rows, one for each province and territory, starting with Newfoundland and Labrador at the top of the chart, and ending with Nunavut as the bottom row. On each row, there is a single red dot that provides the average change in median household total income for the province or region. There are also other circles on each row, and the centre point of each circle indicates the change in median income for a metropolitan area—specifically, a census metropolitan area (CMA) or a census agglomeration (CA). The size of each circle is proportional to the population of the CMA or CA, so larger CMAs and CAs show up as larger circles. Finally, the colour of the circle corresponds to the region (Atlantic, Quebec, Ontario, Prairies, and B.C. and North). 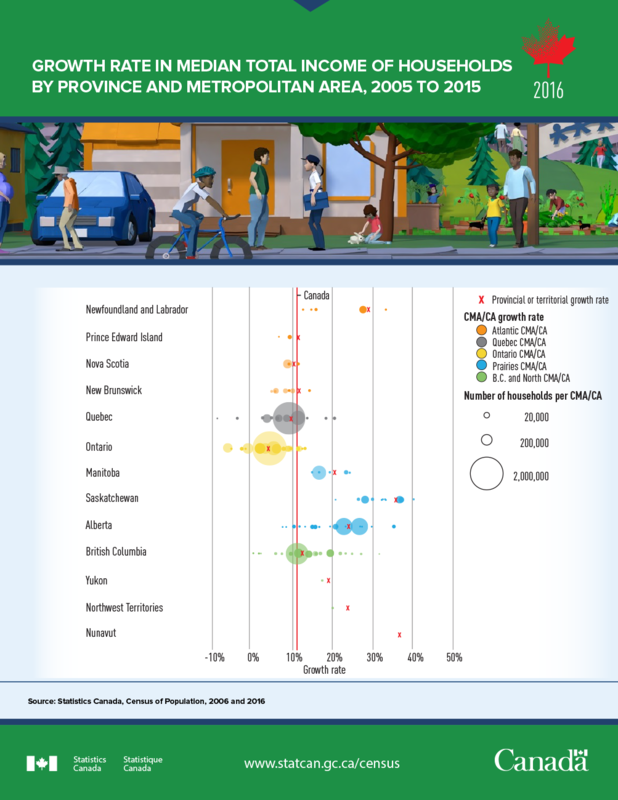 Overall, the chart conveys that below-average median income growth occurred in Ontario and all provinces east of Ontario, with the exception of Newfoundland and Labrador. Median income growth well above the average occurred in Manitoba, Saskatchewan and Alberta, as well as Yukon, the Northwest Territories and Nunavut. British Columbia shows median income growth slightly above the national average. For all provinces and territories, the CMAs and CAs tend to follow the provincial pattern. The following text describes each individual row of the chart. Newfoundland and Labrador's provincial median income growth rate was 28.9%, 18.1 percentage points higher than the national average of 10.8%. All five CMAs and CAs in the province had growth exceeding the national average, with St. John's, the largest, growing by 27.5%. The other growth rates varied from a high of 33.1% in Bay Roberts to a low of 12.4% in Gander. Prince Edward Island's provincial median income growth rate was 11.1%, marginally higher than the national average of 10.8%. Both metropolitan areas in Prince Edward Island had growth rates lower than the national and provincial averages, with the largest, Charlottetown, growing by 9.2%, and Summerside growing by 6.4%. Nova Scotia's provincial median income growth rate was 10.2%, 0.6 percentage points lower than the national average of 10.8%. The growth rates for the five CMAs and CAs in Nova Scotia varied from a low of 8.6% in Halifax and Kentville to a high of 11.2% in New Glasgow. New Brunswick's provincial median income growth rate was 11.0%, which is slightly above the national rate of 10.8%. Of all the CMAs and CAs in New Brunswick, only Miramichi (14.3%) grew faster than the provincial and national rates. The remaining six CMAs and CAs had growth rates between 9.8% in Saint John and 4.6% in Bathurst. Quebec's provincial median income growth rate was 8.9%, 1.9 percentage points below the national average of 10.8%. Median income decreased in two CMAs or CAs in Quebec, with the largest decline in the Quebec portion of Campbellton (-8.9%), followed by Baie-Comeau (-4.1%). The income growth rate of 20.4% in Rouyn-Noranda was 9.6 percentage points above the national growth rate and 11.5 percentage points above the provincial average. Median income grew in the two largest CMAs: by 8.8% in Montréal and by 11.1% in Québec. Ontario's provincial median income growth rate was 3.8%, 7 percentage points below the national average of 10.8%. Eight of the 45 CMAs and CAs in Ontario saw a decrease in median income, with the lowest growth in Windsor (-6.4%). The median income growth rate in the remaining 39 CMAs and CAs varied between 0.1% in Oshawa and 11.8% in Petawawa; 19 of them were above the provincial growth rate of 3.8%. Of the five largest CMAs and CAs in size, Hamilton had the highest median income growth rate, at 5.3%; London had the lowest, at -2.1%; while Toronto is in between, at 3.3%. Manitoba's provincial median income growth rate was 20.3%, 9.5 percentage points above the national average of 10.8%. All six CMAs and CAs in Manitoba had growth exceeding the national average, with Winkler, the largest, growing by 24.2%. The remaining growth rates varied from a high of 23.3% in Brandon to a low of 14.7% in Portage la Prairie. Saskatchewan's provincial median income growth rate was 36.5%, more than three times the national rate of 10.8%. All CMAs and CAs in the province experienced strong growth in median income. The largest growth in a CMA or CA in Saskatchewan was in Yorkton, at 40.5%. The lowest was in Lloydminster, at 20.7%, and this is still 9.9 percentage points above the national rate. Alberta's provincial median income growth rate was 24.0%, which is more than twice the national rate of 10.8%. The largest median income growth rate occurred in Wood Buffalo (35.2%), and the lowest rate occurred in Sylvan Lake (7.8%). The two largest CMAs in Alberta both had growth in median income above the national average. Edmonton had a growth rate of 26.6%, 15.8 percentage points above the national rate. Calgary's growth rate was 22.7%. British Columbia's provincial median income growth rate was 12.2%, 1.4 percentage points above the national rate of 10.8%. Of 26 CMAs and CAs in British Columbia, 18 are above the national growth rate of 10.8%, with Dawson Creek having the largest growth, at 31.6%. The remaining eight CMAs or CAs had growth below the national rate, with Powell River having the lowest growth at 0.2%. The two largest CMAs, Vancouver (11.2%) and Victoria (11.5%), experienced median income growth above the national rate. Yukon's median income growth rate was 18.9%, 8.1 percentage points above the national rate of 10.8%. Its only CMA or CA, Whitehorse, had a growth rate of 17.6%, higher than the national average and slightly lower than the territorial average. The Northwest Territories' median income growth rate was 24.5%, 13.7 percentage points above the national rate of 10.8%. Yellowknife, the only CMA or CA, had a median income growth rate of 20.0%, which is 4.5 percentage points below the provincial average. Nunavut's median income growth rate was 36.7%, more than three times the national rate of 10.8%.